It would seem that the National Firearms Agreement isn’t really an agreement after all. Justice Minister, Michael Keenan – who led the charge against the lever-action shotguns on three occasions and then snuck in more provisions which we have written about previously – doesn’t seem to be fussed if the states walked away from the NFA in part or whole. Whether? This statement, and others in the attachment to his letter, suggest that the NFA is not binding and that they can choose not to implement it. This is important for two reasons. The first is that it means the reclassification of lever-action shotguns is now optional (despite the premiers and then state ministers convening on the matter and making public commitments). The second reason is that the updated NFA had hidden within it, other changes no-one was told about until the document was publicly released. 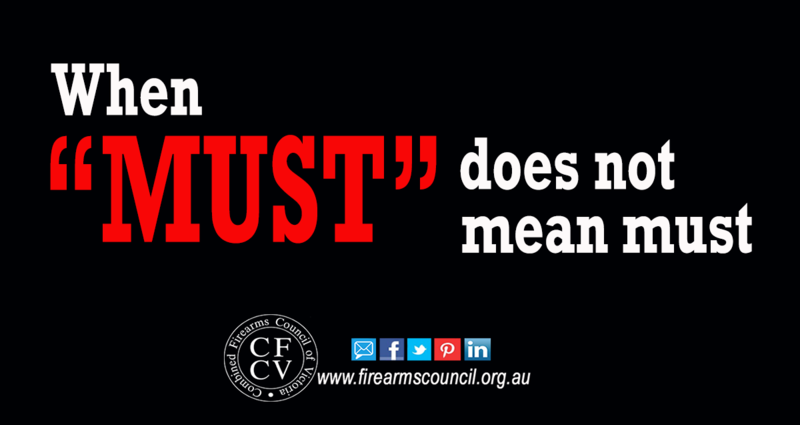 Those changes mainly revolve around the inclusion of the word “must” in several areas where “should” had previously been used (ie in the original, 1996 NFA). The changes imply the states and territories agreed they “must” now do those things. .. and so on the list of “musts” go. Click here to see our previous blog on this issue and joint industry submission spelling out the changes. Keenan’s office had previously verbally advised that the NFA was not binding, now we have it in writing from the boss himself. Click here to see his letter. It’s clear he is trying to provide a distraction from the mistake he has made. That’s the price you pay when you don’t consult. While there is a theoretical risk that drawing this to the states’ attention could prompt them to provide for a stricter implementation of the updated NFA, they can no longer say there is any obligation to – because Minister Keenan says there isn’t. Stricter implementation would have a number of consequences they may not like, such as cutting our Olympic and Commonwealth Games shooting teams in half (as the NFA does not provide for junior licences), discriminating against the deaf and disabled (whose competitions are not listed) and encouraging hoarding of ammunition (through imposing ammunition purchase limits). We doubt they would have the appetite to do that. We encourage you to let your local state and federal members of parliament know that the NFA is now apparently optional, and to advocate for the removal of the recent changes. If you aren’t sure who they are, pls leave a comment with the area you live in, and I’m sure someone will help you with that information and email address. I refer to the recent updates to the National Firearms Agreement (NFA). While the early discussions around the NFA were in relation to the reclassification of lever-action shotguns, it is now very clear that there were many other changes which the jurisdictional premiers and police ministers were not told about. Those changes revolve around the insertion of the word “must” in the NFA, in relation to matters which were previously left to the states and territories to consider for themselves. As a constituent, I would appreciate it if you could follow this up for me, and let me know your view. This letter has come about from the engagement of a consultant who was engaged by a number of shooting organisations. This work has been led by the CFCV to whom many of you have generously donated, and through your membership fees to those organisations who contributed towards it. This is important work which has to be done, and we’re glad to be playing our part. So if you want to know where your donations to us go, that’s part of the answer. Another part, which many of you will know about is the legal action we are taking in relation to Victoria Police’s refusal to release documents relating to the remaking of our Firearm Regulations. We will have more to say about where this is at, probably later this week. The NFA is exactly that: an “Agreement”. While the Federal Government may be able to control the importation of certain types of goods they (the Federal Government) have no constitutional power to mandate Firearms Regulation on the States unless the State agree to those regulations by way of an Agreement. What these deceptive Politicians and their filthy Public Servants would like you to believe is that that have more power than they really do. It is also indicative of the way they do business by quietly changing the wording of previously issued documents and then hoping nobody notices. What each State does, or does not, do in relation to Firearms Regulation is a matter for that State and it’s voters to determine. Just remember this, the Parliament Legislates and we control the Parliament at every election. Deceptive Public Servants on the other hand often act outside their authority by changing that they have no right to change yet we have no recourse against these lifetime fascists. At least we can vote a Politician out, but we are forced to pay Public Servants even when they overstep their authority.